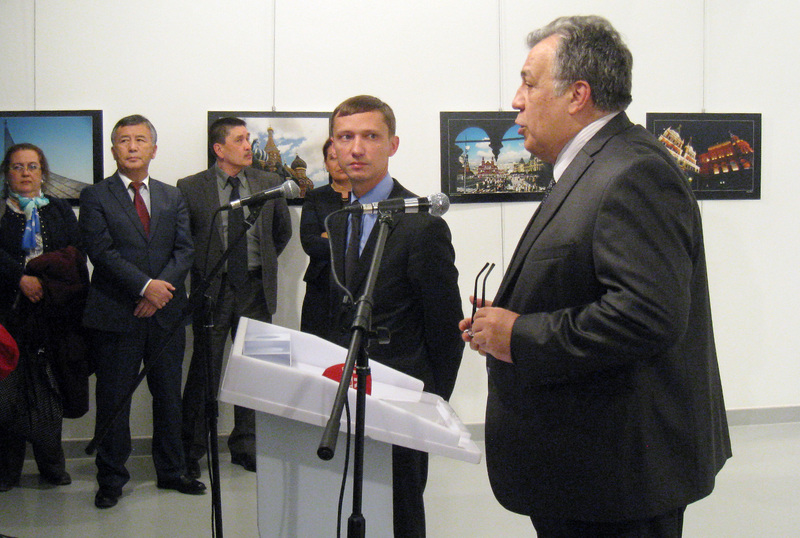 Russia's ambassador to Turkey, Andrey Karlov (R) speaks just before he was shot by a gunman at the art exhibition in Ankara, Turkey, on Dec. 19. Russia's ambassador to Turkey, Andrey Karlov, has been shot at an art exhibition in the Turkish capital of Ankara. On Dec. 19 Russia’s ambassador to Turkey was assassinated in Ankara, on the eve of important talks between Russian, Turkish and Iranian foreign ministers and as a fundamental shift was taking place in the situation in Syria. Why did the attack occur precisely now, who is behind the killing and what will Russia's reaction be? Dmitry Yevstafyev, a Middle East scholar and professor at the Higher School of Economics in Moscow, spoke about the incident in an interview with Eurasia.Expert. Dmitry Gennadievich, why was Russia's ambassador to Turkey assassinated? Dmitry Yevstafyev: We are currently observing unprecedented Russian-Turkish convergence on a whole series of crucial issues – economic and political. In the future this convergence may produce enormous results from the viewpoint of restructuring all relations in the Middle Eastern and Central Asian region. Obviously, many forces, primarily outside Turkey, but also in Turkey, are interested in having this convergence break down. This is a classical provocation, a provocation that was successful and one that, unfortunately, will have consequences regardless of all our understanding that the Turkish government was "set up." Why did the assassination occur precisely at this moment? D.Y. : I would look at four events. First, the vote in the UN Security Council, in which the council basically adopted the Russian approach to the situation in Aleppo. Secondly, the Russian State Duma's approval of an inter-governmental agreement on the new gas transportation corridor between Russia and Turkey, which has already been ratified by Turkey. Thirdly, the meeting on Syria between the Russian, Turkish and Iranian foreign ministers that is being held on Dec. 20. Fourthly, the contacts on regulating the situation around Aleppo that included Syria, Russia and Turkey and which in the upcoming days, Dec. 20-21, were supposed to lead to the final stabilization of the situation inside Aleppo. Therefore, the moment of the assassination was thought out very well and excludes the possibility of the assassin being a "lone fanatic" or a psychologically unbalanced individual. D.Y. : Forces that lost completely, first on the battlefield in Aleppo, then at the UN Security Council and were forced to accept the Russian logic on the Aleppo resolution. They had to admit their defeat. These are people who have serious connections within the Islamist movement and for many years were sponsoring the various "moderate" and "immoderate" opposition groups. We can be fully certain that the organizers of this terrorist act were outside Turkey, although they counted on forces within Turkey as well. Why is the UN Security Council resolution of which you speak so important? D.Y. : The resolution adopted by the UN Security Council basically signifies Bashar al-Assad's government's return to a legitimate juridical field. All Western diplomatic efforts in the last years, including in the UN Security Council, were aimed at delegitimizing Assad's regime and squeezing him out of the juridical field, isolating him from UN institutions. The mass media did not report on this much but experts know that one of the co-authors of the UN Security Council resolution is the Syrian government. Basically, the UN Security Council voted for a resolution in which "Assad's regime" played an active part, a regime that had often been declared "illegitimate." This means that the U.S. and its satellites within the U.S. Security Council have recognized the legitimate character of Bashar Assad's regime, recognizing his control of Aleppo. This is a very difficult choice for Western countries, especially for France and the UK. They were the main "political intercessors" for the opposition that was located in Aleppo. In the future this will remove the numerous impediments to returning the official government in Damascus to the channel of classical official diplomacy, from which in 2012, under the pressure of the U.S., it was practically exiled. That is why the adoption of the resolution on Aleppo is a momentous event, one that for a long time will determine the essence of what is happening in Syria. How will the assassination of the Russian ambassador influence the talks between the Russian, Turkish and Iranian foreign ministers on Dec. 20? D.Y. : I think that these talks are one of the key events in our relations with Turkey that was supposed to be undermined. The atmosphere of these talks will obviously be very heavy. Russia will inevitably raise the issue of how well the Turkish government is controlling the situation in its country. The assassin was a recently dismissed employee of the Turkish police. But for Russia this tragedy, as well as everything that will happen in the upcoming days, is a big test for its geopolitical maturity. Today, after the collapse of the 1990s and the glamour of the 2000s, when our politics in many aspects was limited to propaganda, we have entered the sphere of realpolitik. Contemporary realpolitik somewhat differs from the way politics are described in textbooks. For the sake of achieving immediate results, sometimes narrow circles within the political elites of certain countries choose to assassinate ambassadors, support and finance terrorists, blow up planes and do many other things that respectable countries did not permit themselves in the 1990s. And despite this, we must be responsible in our understanding of the choice we made. We must show a high level of maturity and distance ourselves from our emotions. Russia has assumed a burden, the burden of a global player, and we must show that our society is capable of carrying that burden. Unfortunately, we were unable to save our man, the Russian ambassador. And this is also our fault as a state. This means that there was something that we didn’t predict, something that we didn’t take into consideration. But we must clearly understand that when we reply, the pain should be felt only by those who prepared this provocation. And no one else. Our response must be proportioned, targeted, extremely harsh. Yes, extremely harsh. All moral-ethical limits have been removed from us and for these limits to be put back in place, we must show our capability of "raising the level" by carrying out, as they say in professional circles, a vertical and horizontal escalation. Otherwise those forces that, at least, sanctioned the terrorist act against the Russian ambassador, will not be contained. But our response should not worsen Russia's position as the leading country in today's restructuring of the world economic and political order. What might Russia's concrete response be? D.Y. : The reaction will mostly be political. I think that some international forces "will be rejected from Russia's court" and they will not be able to count on our support in difficult times. Relations with other countries will be frozen until they demonstrate that they were not involved in this terrorist act. In this case the presumption of innocence does not exist. I am speaking primarily about Saudi Arabia, which, taking into account some former circumstances, must prove that it was not involved in this act. Preferably with actions. Concerning the "response with force," about which many people are speaking now, let's leave this question to the specialists. And let's not harbor the illusion that we will read about this "response with force" in the mass media.